In January 2014, a trial excavation was conducted at Horbat Usha (Permit No. A-6998; map ref. 213453–519/744199–303), prior to paving Section 3 of Highway 6. The excavation, undertaken on behalf of the Israel Antiquities Authority and financed by the Cross-Israel Highway Company, Ltd., was directed by A. Massarwa (photography), with the assistance of Y. Amrani and E. Bachar (administration), R. Mishayev and Kahan (surveying and drafting), A. Gorzalczany (scientific guidance), P. Gendelman (pottery), M. Shuiskaya (pottery drawing), C. Ben-Ari and A. Dagot (GPS) and K. Sa‘id. The excavation was conducted along the southwestern fringes of the Horbat Usha, c. 1 km south of Somakh Junction (Fig. 1). According to historical sources, the Sanhedrin moved to the Jewish settlement at Usha following the Bar Kokhba revolt. Several excavations and surveys were carried out at the site (Olami and Gal 2004: Site 74; Oshri 2012 [A-5372, A-5599]; Massarwa 2014 [A-6752]; Kirzner 2015 [A-7093]; Permit Nos. A-6880, A-6921; Fig. 1). Among the antiquities uncovered in the excavations were remains of building foundations, a mosaic floor, broken architectural elements, a sheikh’s tomb and rock-hewn tombs, wells, agricultural installations, winepresses and an oil press. Based on the finds it was determined the site was continuously inhabited from the Roman period until the Ottoman period. 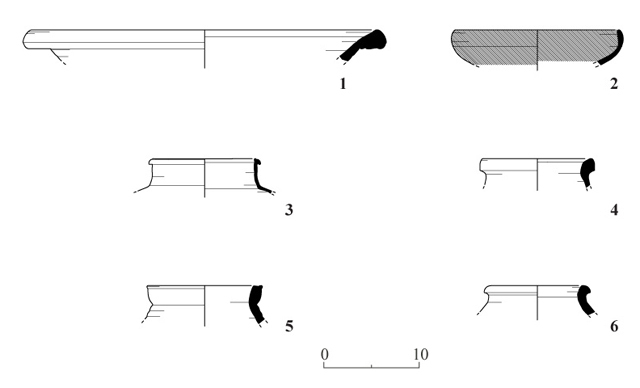 A rectangular excavation area was opened along a northeast–southwest axis (Fig. 2). Squares B1 and B2. The collapsed remains of a wall (W10; exposed length 2 m) aligned in an east–west direction were exposed in Sq B2. The wall was built of roughly hewn limestone (0.4 × 0.3 × 0.5 m) and was founded on clay soil. A habitation level (L103) ascribed to the Persian period was revealed near the wall. 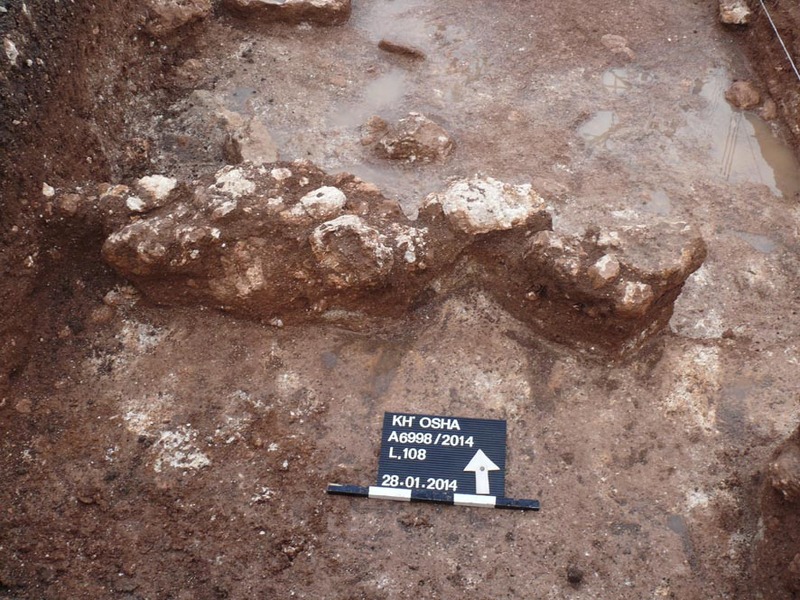 The excavation was expanded to the northeast, to Sq B1, and a layer of alluvium (L107) was exposed. The ceramic finds from Sq B2 included a slipped bowl from the Hellenistic period (Fig. 3:2) and jars from the Persian period (sixth–fourth centuries BCE; Fig. 3:3, 4). Squares B3 and B4. Remains of a collapsed wall (W11; exposed length 1.8 m; Fig. 4) aligned in an east–west direction were exposed in Sq B3. The wall was constructed of roughly hewn limestone (0.1 × 0.2 × 0.3 m) and was founded on clay soil. The square was expanded to the southwest, to Sq B4. The pottery discovered close to the wall (L106) included a mortarium (Fig. 3:1) and jars (Fig. 3:5, 6) dating to the Persian period (sixth–fourth centuries BCE). Remains of a circular rock-hewn installation (L109; diam. 2.5 m; Fig. 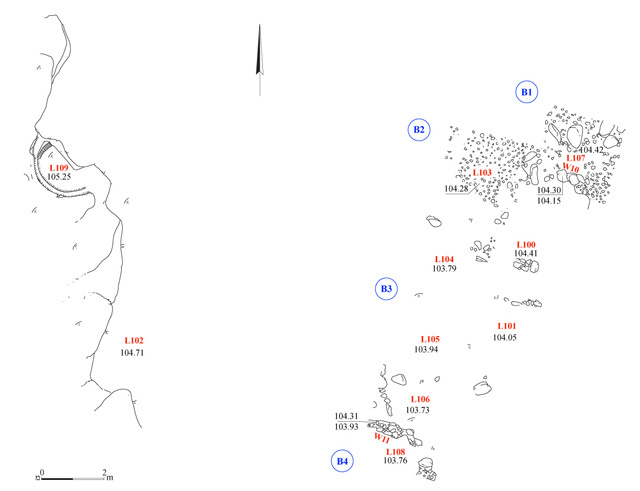 5) were documented c. 5 m west of the excavation area. It was severely damaged in the past, probably when the electric company was installing infrastructure there. The absence of datable finds and the extensive damage to the installation made it difficult to date and impossible to determine its use. Kirzner D. 2015. Horbat Usha. HA-ESI 127. Massarwa A. 2014. Horbat Usha. HA-ESI 126. Olami J. and Gal Z. 2004. 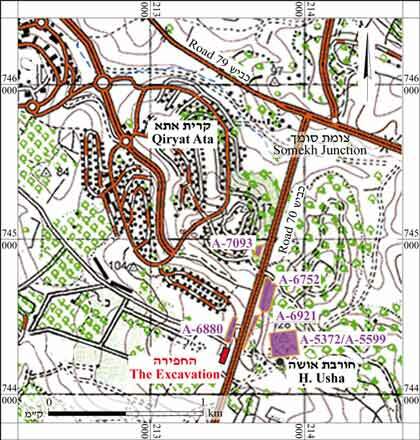 Map of Shefar‘am (24) (Archaeological Survey of Israel). Jerusalem. Oshri A. 2012. Horbat Usha. HA-ESI 124. 3. Wall 11, looking north. 5. 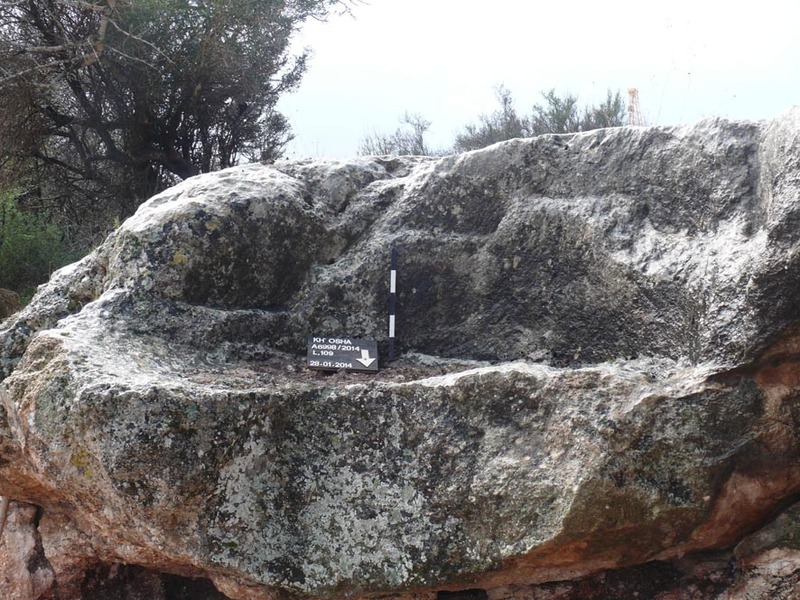 A rock-hewn installation, looking southwest.